While designing PowerPoint templates you can take advantage of the Theme Colors feature to create or use pre-defined color palettes for your presentation. Then, switching the Theme Color palette during design time you can easily give your presentation a different look. 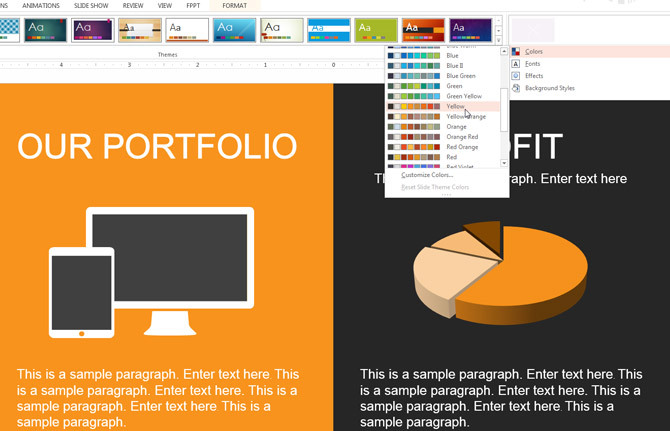 In this article we will show you how to create and edit a custom color palette in order to make PowerPoint themes that can be easily edited to match any other color combination. 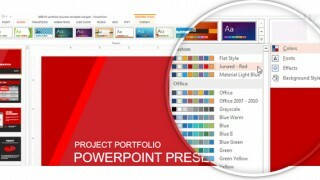 In this example we have used the Red Project Portfolio PowerPoint template that you can download from our site. This PowerPoint template was created using the concepts described below so you can easily change the theme colors to match any other color combination or color palette. After opening the presentation or PowerPoint template where you want to apply this technique, go to Design menu and then look for the Variants section. Click the small arrow icon to open the popup menu and then choose Colors. The Edit Theme Colors dialog box will appear. Here you can set up to 12 color variants for the same presentation. Each color you configure here will be used for different purposes in your presentation. For example, the Accent colors can help you to highlight areas of your presentation or you can use them as a color of your PowerPoint graphics or shapes, while the text/background colors are normally used for Text or PowerPoint background. By adjusting the color values for Accent 1..6 entries, you can create awesome presentation template variants with a different set of color combinations. The Hyperlink and Followed Hyperlink colors are used for hyperlinks added to your slides. Unless you use links in your slides, you won’t find very useful these two color values. For each color you pick from the color picker, you will notice that there are some variants added to the color palette. This will become very useful to add new hue or tones of the same color into your presentation objects. Once you finishes editing the color palette, assign a Name to the color theme and then click Save to save the changes. The next important step you need to complete in order to prepare your presentations using Theme Colors, is to pick carefully what colors to use on each PowerPoint presentation object, chart, text or shape. In this example we chose the red color from the Theme Colors palette in order to make a red presentation. 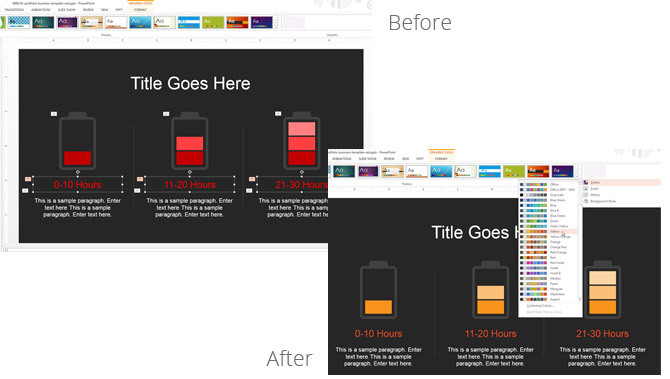 Once you pick and assign all the colors carefully to your PowerPoint objects you can preview the magic of switching a different Theme Color. For example, if you want to switch the current color palette to use a different color set using yellow instead of red, you can go to Design menu and then from the Variants section choose Colors and pick a different Theme Colors from the pre-defined color combinations. Here you can see a real example using a yellow presentation theme. 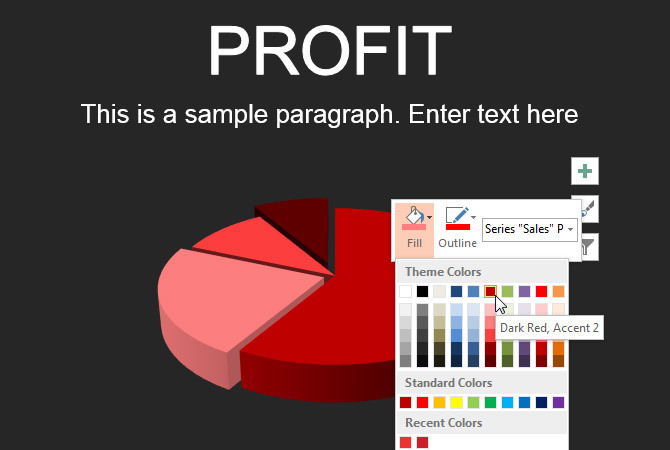 You can also apply custom colors from the Theme Colors palette to PowerPoint charts. In the following example we can see how to apply the color palette to a 3D Pie Chart. Select the chart series that you want to update and then find the Fill button in the context menu. Here you can choose colors from the Theme Colors palette as shown below. If you need to share a color palette with other PowerPoint designers or between different members of your team, you can find the custom Theme Colors saved as a XML file in the following folder ~/AppData/Roaming/Microsoft/Templates/Document Themes/Theme Colors. Finding the file that correspond to your custom color palette you can copy and paste it or share it online. 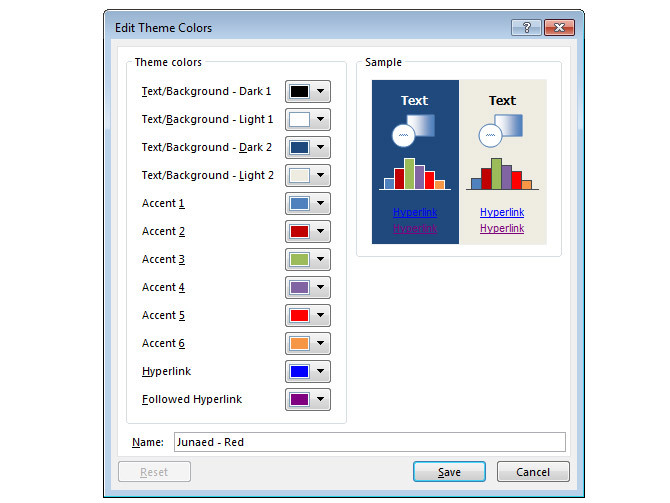 The color themes can also be saved as a PowerPoint theme (.thmx file format). To save the current theme go to Design menu and then under Themes section click the down arrow small button. Then click Save Current Theme… to open the Save dialog box. Using the approach described in this article you can easily change the PowerPoint presentation colors to use the new color palette. Below you can see a real example showing how we have changed the colors affecting the battery cliparts by selecting a pre-defined color palette from Design -> Variants -> Colors. Using Theme Colors you can easily manipulate your presentation colors and create other variants of your PowerPoint presentations and PPT templates using a different set of color palettes. This way, you can make the presentation match your corporate visual identity or make additional variants for other presentation needs.